Don’t you just love this time of the year? Our neighborhood just smells like summer with all the BBQs that keep getting fired up every day. And not to be outdone, our BBQ will get a good workout tonight with these lemonade grilled chicken legs. They are wonderful as a main course and are also one of my best easy appetizers. This shop has been compensated by Collective Bias, Inc. and The Coca-Cola Company. All opinions are mine alone. 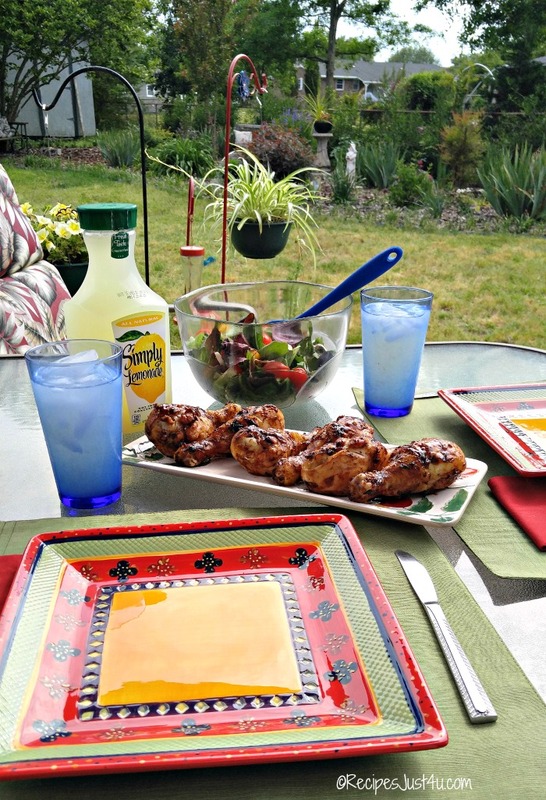 #BestSummerBBQ #CollectiveBias It’s time for some lemonade grilled chicken legs. 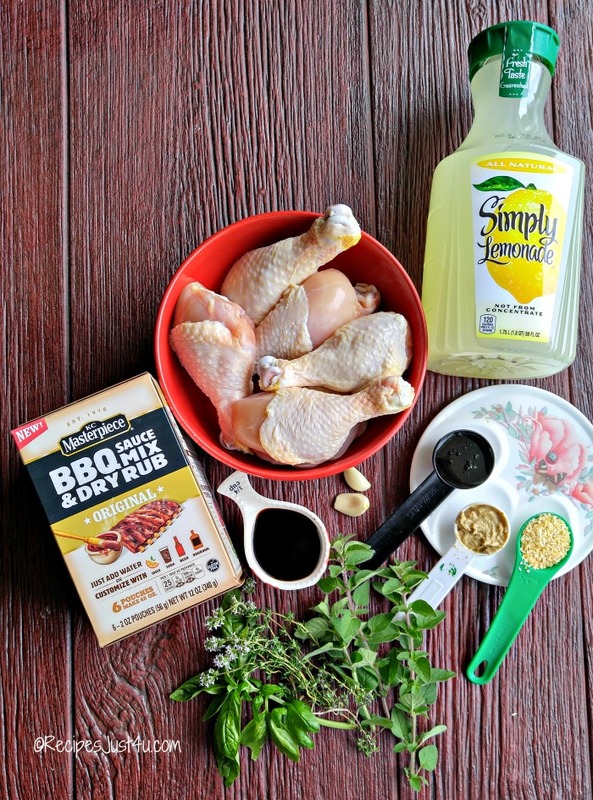 I wanted something that is both sweet and tangy to marinate the legs in before grilling them so I started combining ingredients in my mind, and I kept thinking about lemonade and honey and wondering how they would work. Little did I know, then, what a wining combination it was to be! Need a great side dish to go along with your chicken legs? Try this Southern coleslaw.The dressing is just amazing! Fire up the BBQ, it’s time for some lemonade grilled chicken legs. 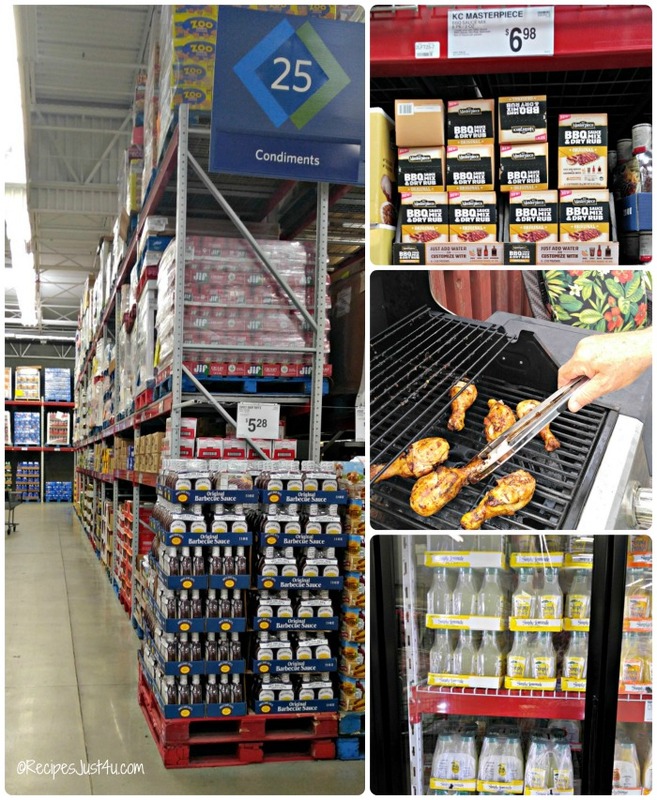 Off I went to my local Sam’s club to get everything needed for my recipe for lemonade grilled chicken legs. While there, I found a new product for grilling, in the marinade aisle. It is KC Masterpiece® BBQ Sauce Mix & Dry Rub. This fabulous product makes it easy for anyone to customize your barbecue sauce so that it tastes just the way you like it. And since customizing is my middle name when it comes to cooking, I just knew I had to put this into my shopping cart! As soon as I saw this mix, the marinade started coming together in my mind. I went hunting for the rest of the ingredients. 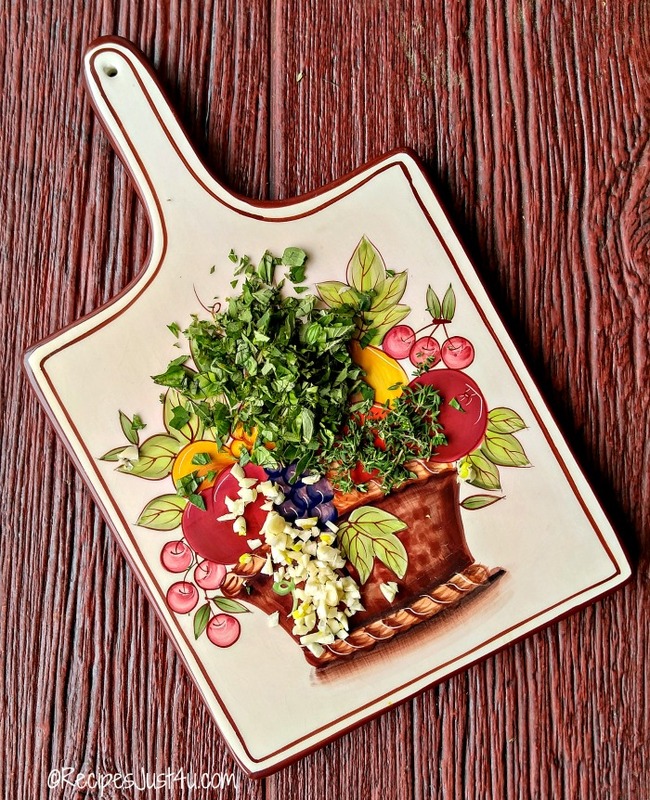 I chose Simply Lemonade®, honey mustard, honey and since I love to garden, I also brought in a bunch of home grown fresh herbs when I got home. I chose basil, oregano and thyme Just look at what will go into my marinade. How can this not be just a drool worthy BBQ? The marinade is super easy to make. First, I chopped my fresh herbs and garlic. I love using home grown herbs in just about everything I cook. I grow fresh herbs on my deck so that I have them to use most of the year. I’ve even been known to clip some rosemary and fresh thyme in the winter with snow on the ground. Some herbs are just plain hardy! Next, I combined the Simply Lemonade®, onion flakes, balsamic vinegar, mustard and honeyin a medium sized bowl and mixed it well to combine all the flavors. This fabulous mixture plus the chopped herbs and garlic just get mixed together. Then, for the star of the marinade, in goes the KC Masterpiece® BBQ Sauce Mix & Dry Rub. This mix thickens the mixture to the consistency of bottled sauce, with just a few stirs, and it tastes A-MAZ-ING. I really mean it – best BBQ sauce ever! I love that I can switch it around next time I barbecue to add different flavors. Instead of having a bunch of jars of BBQ sauce in my pantry, I can have just this one box and I customize it each time. What a win!! I seasoned the chicken legs with sea salt and cracked black pepper and then poured the marinade over the top and placed them in the fridge for 30 minutes. The longer you marinate meat, the better it will be, so you could even do this step the night before, or first thing in the morning. Just before grilling, I took the chicken out of the fridge to brought them to room temperature, while I prepared the grill. I cleaned the grill bars with a grill brush and then oiled them with some olive oil so the chicken would not stick. TIP: Indirect heat is a good way to cook chicken legs with skin. 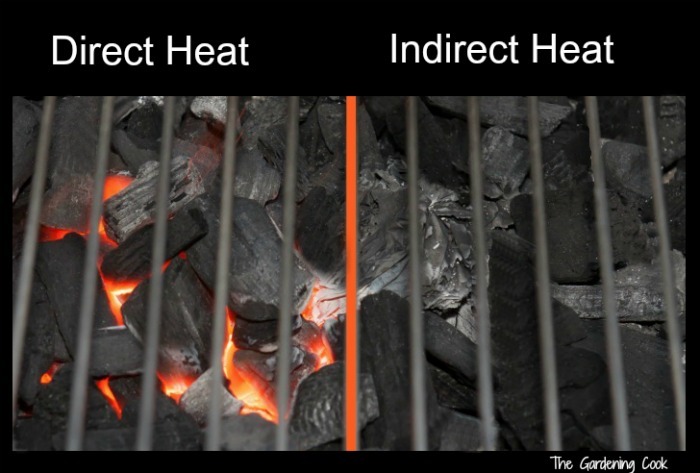 If you use charcoal, indirect heat means that you have hot coals on one side of the grill plate and you cook on the opposite side for slower cooking with the top closed. This type of grilling makes the BBQwork a bit like an oven when you close the lid but still gives you great grill markings. Don’t use charcoal? 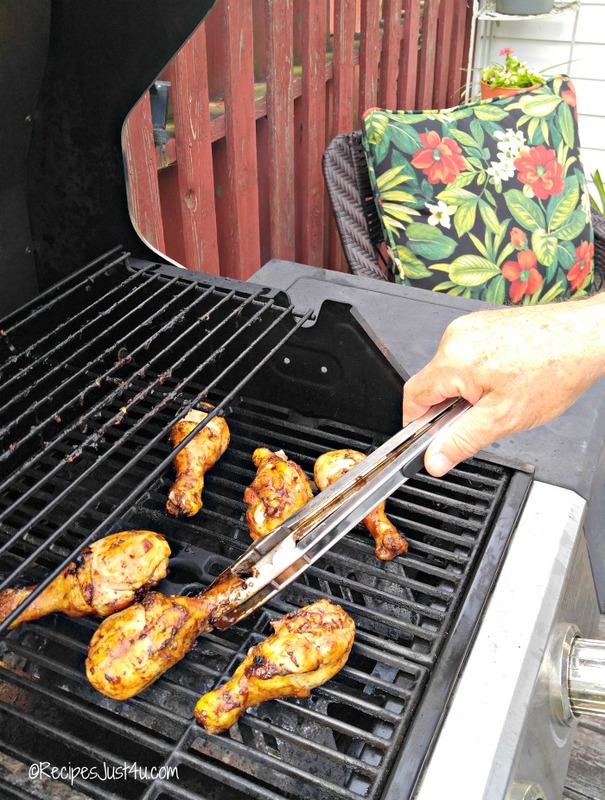 My husband grilled the chicken legs over indirect heat on our gas grill. He turned the burners on low and placed the chicken on the top grill bars and closed the lid. Then he finished them off with some of the reserved BBQ sauce over the lower grills for the last few minutes. 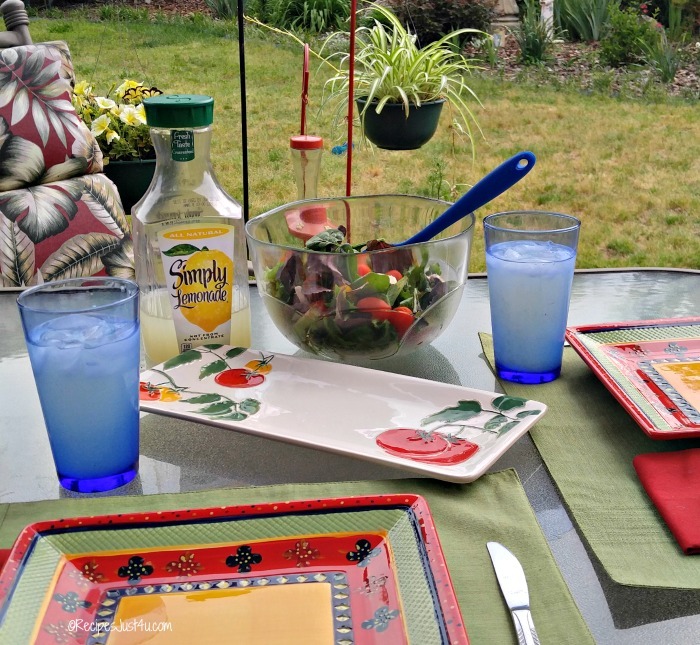 I prepared the patio table and we sat down to a tall glass of the Simply Lemonade® while we waited for the chicken to cook. Long slow cooking really is the key to super juicy chicken legs. We just had to check them every 10 minutes or so. Cooking them this way insures that they will be very juicy and the skin will not burn. Plus it gave us a chance to catch up on our day in a really relaxing way. 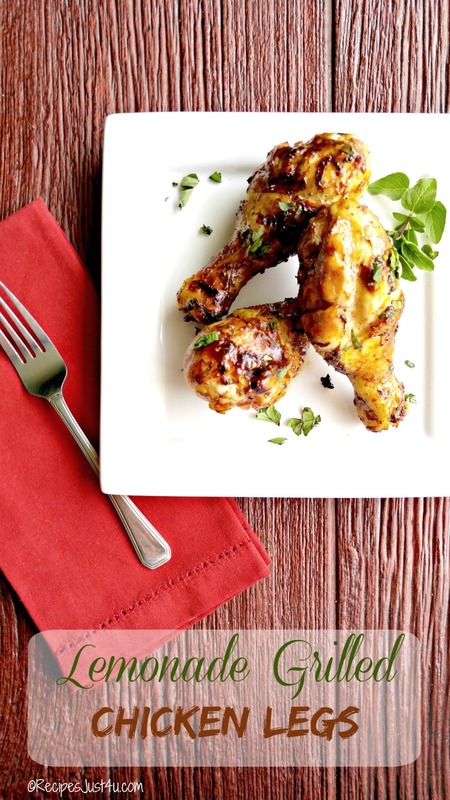 The lemonade grilled chicken legs have the most amazing flavor. They have a delightful combination of both sweet and tangy tastes, and are just beautifully moist and delicious. I served them with a big tossed salad. And the drink? Why, of course, more Simply Lemonade®, since what goes better with lemonade grilled chicken legs than a tall glass of icy cold lemonade that I used in the marinade? Ready for a party in your mouth? Did into one of these super delicious lemonade grilled chicken legs. Summer has BEGUN!! 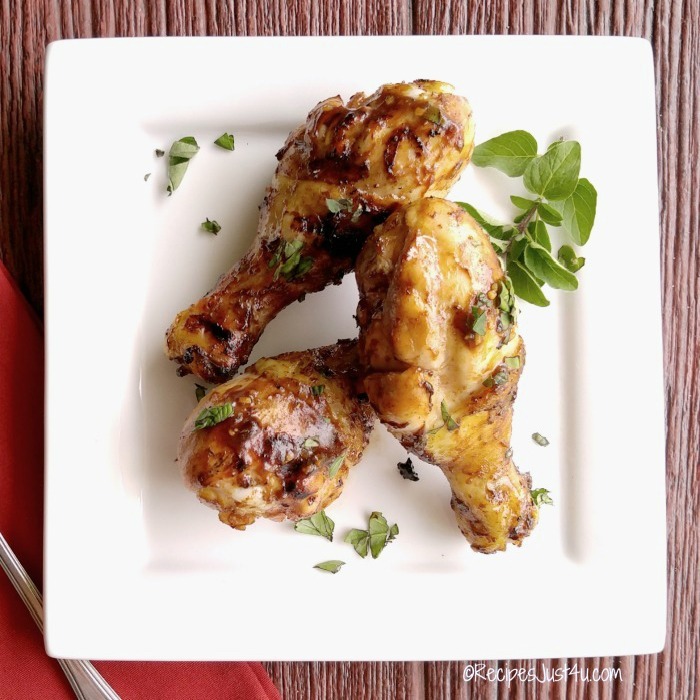 Would you like to make these lemonade grilled chicken legs for your family? Just head to your local Sam’s club to shop for the ingredients. It is simple the best place to shop for all of your summer entertaining needs! Are you a creative grill master? 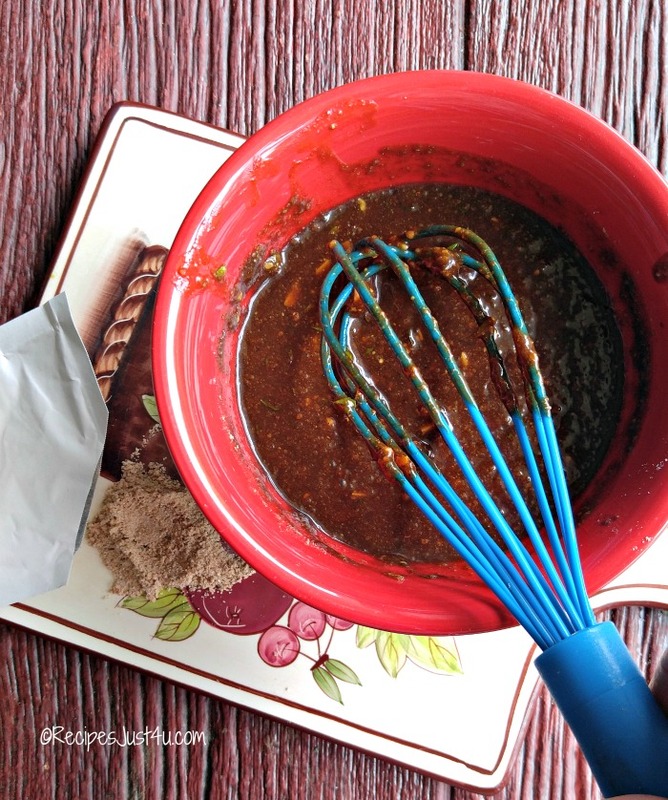 How would you use the KC Masterpiece® BBQ Sauce Mix & Dry Rub on your next grilling session? This mix is great on pork, beef, chicken or veggies, so it is very versatile. Please let us know how you would use it in the comments below. Combine the Simply Lemonade®, balsamic vinegar, onion flakes, Dijon mustard and honey in a medium sized bowl. Mix well. Chop the garlic and herbs finely and add to the lemonade mixture. Stir well to combine. Stir in the KC Masterpiece® BBQ Sauce Mix & Dry Rub. Mix well and set aside. Remove the chicken from the fridge and bring it to room temperature while you get the grill hot. Reserve the marinade to brush on later. Cook the chicken over indirect heat until it is almost cooked. Brush on the reserved grill sauce during the last few minutes of cooking time. Carol thanks for this amazing recipe chicken is mine favorite and if i can not find honey than which thing i should eat. Maple syrup or agave syrup would also work. Plain sugar would also work. This sounds delicious. Ive only just started recently using fizzy drinks as marinade bases (dr pepper and pork ribs mmmmm) – so im itching to give this a try! This sounds right up my alley! We are definitely going to try this recipe. However, I’ve always read that you shouldn’t use the liquid that chicken is marinated in without boiling it to kill any salmonella that might be present. I usually do a recipe and a half and save the half portion to baste with. Hi Dave. Thanks for the comment on the reserved marinade. 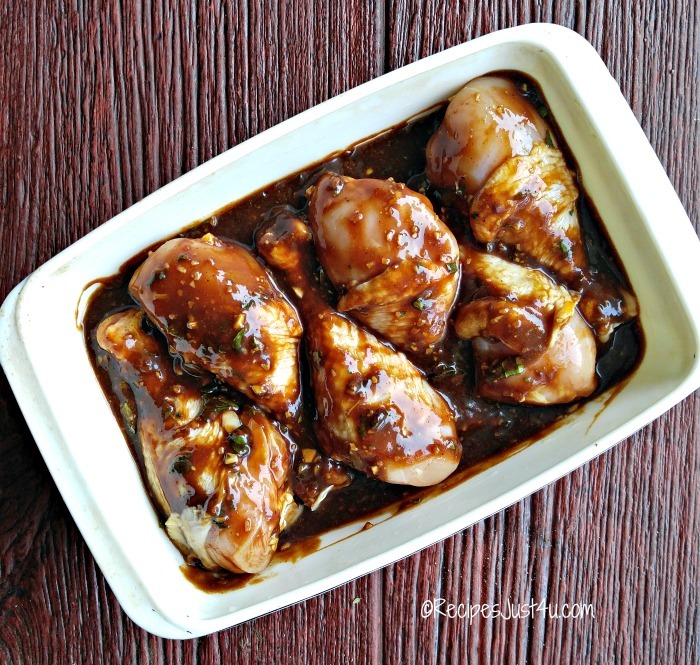 I updated my recipe to show that I save some marinade for basting. Sorry that my post was not clear on this. It is a good safety tip. I would never have thought of putting lemonade into a marinade. But it makes great sense – the acid would help break down the fibers in the meat. Thanks for the recipe. This sounds delicious! The hubby loves chicken legs I bet he would love these. We will have to give this a try once he gets the grill uncovered and hooked back up. Our grill gets a workout even in the snow! Thanks Jacki. This one is MY personal favorite. I absolutely love the product that made the marinade. Saves having tons of bottles in the pantry. It’s a keeper for me! Another great recipe for summer! I’m collecting them on my Pinterest board to come back to.